I installed the DarqUI persona window into my ProfitUI interface as per the instructions. I really like the look and would like to use it but there's something wrong with the layout. It looks nothing like the picture and there are no slots showing the bank, etc. Also, the categories on the left are there but blank. I'm including a photo in the hope someone can help me get this set up. From the DarqUI folder, copy eq2ui_listboxrow_sidetab_template2.xml to your profit folder. Last edited by Blackhood : 09-06-2018 at 08:58 PM. The sidetab file is indeed the right one. 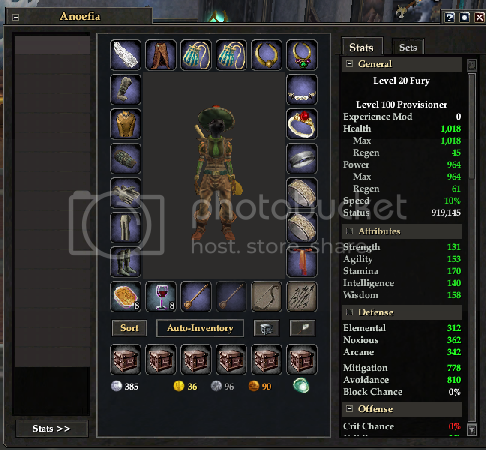 You will also need eq2ui_listboxrow_mercenary_template2.xml to use the condensed mercenary list shown here. I'm not sure what you mean about slots showing the bank, etc. Can you describe that a different way? Oh yes the mercenary tab is great too, with the pull ability. So much easier. I was looking at the census reference as well, to see what the characters have and such. I'm very impressed! How difficult is it to switch from ProfitUI to DarqUI? Would I just have to change the eq2.ini? It's even easier than that. In the DarqUI utility, go to the Files page and click "Make this UI the default." To switch back to ProfitUI, click the same link in the ProfitUI_CE utility. Restart the game and you should be good to go. You can go back to the basic game default by clicking "Stop using this UI as the default" in either utility. Access to the path 'C\Program Files\Sony\EverQuest II\UI\Default\images\icon_is 19.dds' is denied. System.UnauthorizedAccessException: Access to the path 'C:\Program Files\Sony\EverQuest II\UI\Default\images\icons\icon_is19.dds' is denied. Most of that is just telling you what .NET version you have. The interesting part is the path to your game, and the fact that the utility does not have access to that path. The default location for installing the game these days is \Users\Public, which does not limit file access, rather than \Program Files. Try right-clicking the utility and running as administrator, and see if you get a better result. Ok I moved everything to the \Users\Public location (the other path was a leftover from being one of the very (ahem) old players heh). I didn't copy any UI over except Default and reinstalled DarqUI, then set it to run as admin. Same issue. i get it right after it loads the mount logo (I assume that's what the little horse is) I have also tried different character and different accounts, then I tried a different computer. Still the same issue. I'm a little stumped right now. The one it's hanging up on is the wardrobe icon, which gets displayed right after the mount. That's consistent with the reference to icon_is19.dds in your error message. The mount icon is in a different file, but in the same folder. So it's possible the file access issue is specific only to some of the image files. Try this: Go to the \UI\Default\images\icons folder and delete icon_is19.dds, then run the EQII patcher and let it re-download the file. Then reopen the utility and see if the wardrobe icon will display. Ok! I deleted that icon and it complained about the next one in line so I deleted the directory and after patching, it's working! Now to get back to setting things up.